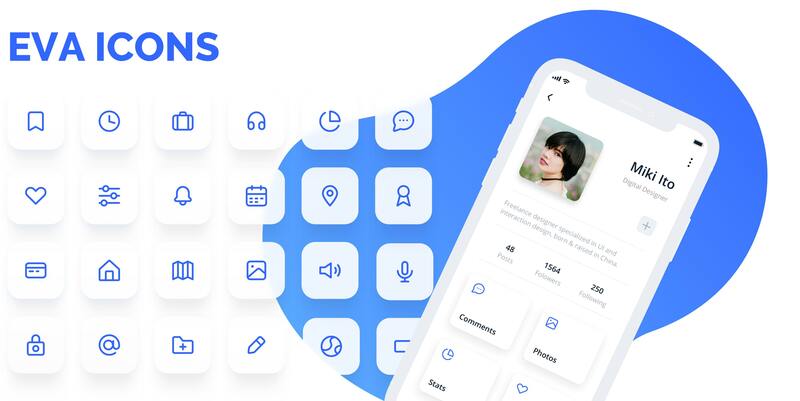 Eva Icons is a pack of more than 480 beautifully crafted Open Source icons for common actions and items. Additionally, Eva Icons supports 4 animation types: zoom, pulse, shake and flip. Download on desktop to use them in your digital products for Web, iOS and Android. Icons are provided in two visual types: Fill and Outline and in several formats, including PNG, SVG, font, Sketch, etc. Replaces all elements that have a data-eva attribute with SVG markup. data-eva-hover: Makes the animation available on hover. Default value is true. Available true or false. data-eva-infinite: Makes the animation infinite. Default value is false. Available true or false. Note: In the above example github icon will be always animated. This type of animation will be applied only to current icons. Pass animation as property in a eva.replace method. Note: The animation will be applied to all replaced elements. Add eva-parent-hover class to the parent container in a case you want to activate the animation hovering on the parent element. Made with :heart: by Akveo team. Follow us on Twitter to get the latest news first! We're always happy to receive your feedback!